A trip to San Francisco is not complete without a ride on one of the San Francisco cable cars. Be sure you know the routes, rates and the best ways to save money on your ride. Andrew Smith Hallidie moved to the United States from England in 1852. His father had filed the first patent in Great Britain for wire rope. Hallidie used the wire rope to design a bridge across the American River in Sacramento as well as for pulling heavy ore cars out of the underground mines in the California mountains. Hallidie saw the advantage of using wire rope to pull cars up the steep hills of San Francisco. He started the first cable car line on Clay Street in 1873 for $85,150. The number of cable cars and lines grew until 1906 when most lines and cars were damaged in the 1906 earthquake. By 1912 only eight cable car lines were in service in San Francisco. In 1944 the City and County of San Francisco took over the two Powell Street cable lines. By 1957 all of the current lines were running and the cables were linked to the Washington-Mason Cable Car Powerhouse. 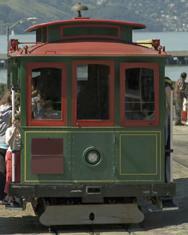 In 1964 San Francisco's current cable car system was designated a special, "moving" National Historic Landmark. The entire system was rebuilt in 1982 and all of the historic cars were refurbished. A wire cable runs under the street. The cable car grips the wire and is carried along until the gripman releases the brake and the car stops running. Main track brakes - These are operated by the long red lever in the front of the car. In 1998 Fannie Mae Barnes became the first female deemed by MUNI to have the upper body strength necessary to be a grip operator and operate the main track brakes of the cable car. Front wheel brakes - These are operated by the grip operator using the foot pedal in the front of the car. Rear wheel brakes - These are operated by a crank at the back of the car. The cable cars run everyday from about 6:00 AM to after midnight. Actual timetables are available online and are posted on signs at the cable car stops. The Cable Car Barn & Powerhouse is an excellent place to view the actual cable winding machinery as well as displays of antique cable cars. The Barn is located at the corner of Washington and Mason Streets. It is open every day except Thanksgiving, Christmas and New Year's Day. California Street - Covers both directions of California Street from Embarcadero through the Financial District, through Chinatown, over Nob Hill to Van Ness. Adults and youths (ages 5 to 17) - $5 each way for a single ride on a cable car. Children ages 4 and younger ride free. Seniors (over age 65) and disabled - $5 each way, but the fare is only $1 before 7 AM or after 9 PM. There are no transfers accepted or issued. If you need to transfer to a bus, you will need to pay a separate fare for your bus ride. At $5 for a single, one-way ride, jumping on and off the cable car system while sightseeing can get expensive. Consider purchasing a MUNI Passport. It will give you a major savings if you plan to ride several routes of the cable car system or if you will be riding the cable cars, MUNI buses, streetcars and underground trains for several days. The Passport provides unlimited rides on all MUNI buses, streetcars, underground trains and cable cars. A 1-day, 3-day or 7-day passport can be purchased in advance at various San Francisco locations including in the baggage claim area of the San Francisco International Airport. You can also purchase a 1-day Passport from the conductor on any cable car. A Passport purchased from a conductor must be used on the day it is purchased. Cost of the Passport ranges from $11 for a 1-day Passport to $24 for a 7-day Passport. Each rider must have a separate Passport. Tickets can be purchased from automatic ticket machines at the ends of the lines and from the conductor as you board the cable car. Conductors can only make change for up to $20, so don't expect them to have change for a $50 bill! You can board the cable car at a turntable at the end of the route or anywhere the cable car stop sign is posted. To board at a cable car stop, wave to alert the gripman to stop. When the car comes to a complete stop, you can enter on either side of the car. You can sit inside, outside or stand and hang onto the special poles provided on the outside of the car. The conductor will take your ticket if you enter from the back of the cable car. If you get on to the front of the cable car and sit outside, facing out with your back to the brakeman, the conductor will come by and pick up your ticket after the trip gets underway. Cable cars are not wheelchair accessible. You cannot bring a bike onto a cable car.